Darell with the members of the Tunoh Youth Choir. PENAMPANG: Those calling for Parti Pribumi Bersatu Malaysia (PPBM) to spread its wings to Sabah are trying to get the party to breach its unwritten understanding with Parti Warisan Sabah (Warisan), said Warisan deputy president Datuk Darell Leiking. “I would like to stress this, there was always an unwritten understanding between PPBM and Warisan as expressed by Tun Mahathir and Tan Sri Muhyiddin before the election,” said Darell. Warisan, he said, had maintained its position by fighting its cause independent from Pakatan Harapan but working with the coalition. “We managed to take over the government in May and ever since then we have been doing all right. So, those people who have been asking PPBM to come to Sabah are encouraging PPBM to breach their understanding with us. “Of course it is their right (and) I cannot stop them from exercising their constitutional right (but) who are these people? Look at them? Are these the people who talk good of PH? Were these the same people who called us traitors? Weren’t they the ones who said they do not want us? Now, suddenly they want use PPBM to unite Sabahans? “We are reshaping Sabah into the way it should be. At the moment, you can see that Warisan has the majority representation in the state government. We have PH supporting us and vice versa,” he said. Darell, who was met at the Penampang Christmas Thanksgiving program organised by the Pusat Khidmat Rakyat Penampang, said this when asked about calls for PPBM to expand to Sabah. The Penampang member of parliament claimed that some of those trying to stir up trouble were members of a local political party, and what they have done is to create a notion that there is a problem in Sabah which can be resolved if PPBM sets up a chapter in the state. “Through their lies, they hope to bring in other parties to Sabah and causing a disruption to Sabah, but we will not stand down. I believe that Tun Dr Mahathir will maintain his promise and Tan Sri Muhyiddin would too even though there are some people in their party who think Sabah is like KL. “It is not and KL is not Sabah,” he stressed. Meanwhile, when asked about a request from Persatuan Pengimport dan Peniaga Kenderaan Melayu Malaysia (PEKEMA) Sabah for an extension of the AP (approved permits) which expires on December 31 this year, Darell said that he will consider allowing them a one month period. According to the Minister of International Trade and Industry, the AP was only approved and released to PEKEMA Sabah in August soon after he was appointed to the post. “I read and understand their concerns, I have also read about previous cases where extension was granted. So I believe I will be able to consider extending it but subject to conditions. “I am aiming for the end of January 2019. At least, we are fair to them and they can let go of whatever they can and no more extension after that,” said Darell. 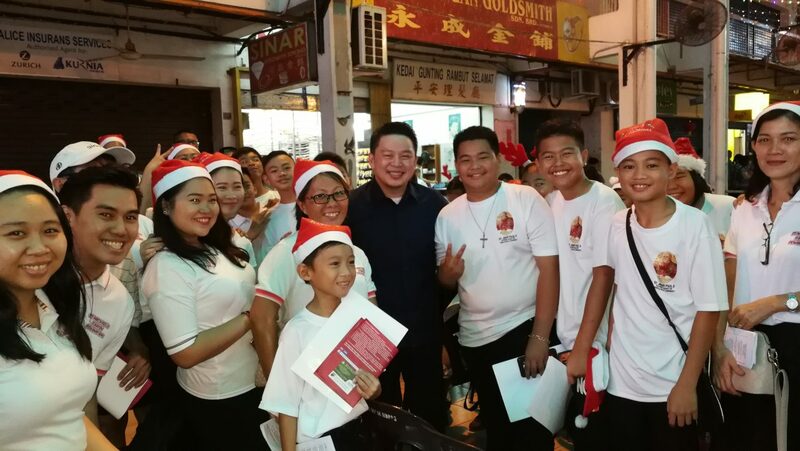 On the event itself, Darell said other than showing the racial and religious diversification in Penampang, it was also an opportunity to meet and thank his constituents. It is not about politics, it is about the season of togetherness and at the same time to have a gathering with the rakyat, he said. During the event, Darell presented donations to three welfare homes, 12 schools and nine religious organisations.